If you print carbon fibre filled, or other abrasive materials this is the nozzle you need! Carbon filled filaments will cause rapid and significant damage to standard nozzles. 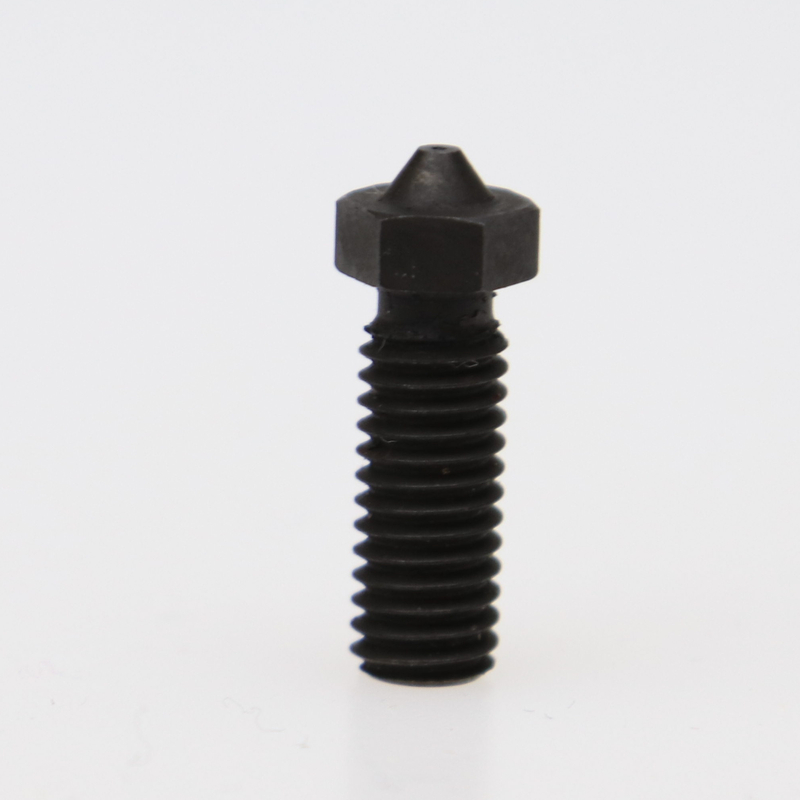 E3D has developed these incredibly wear-resistant nozzles that basically eliminate wear. A standard E3D-v6 Brass nozzle will be significantly worn by printing just 250g of carbon fibre material, that means you could get through 3 nozzles with a single spool of material! However these new nozzles will not wear out, even in extended use with very abrasive materials. Paying a little extra for a hardened, wear-resistant nozzle makes both practical and economic sense. By the time you’ve printed a single spool of abrasive filament you’re saving money. It also saves a lot of time as you won’t be constantly replacing worn out nozzles. Furthermore you’ll be future-proofed for upcoming materials, these nozzles should be able to handle just about anything the material manufacturers think of next. Because of the thermal and chemical treatment applied to the nozzle they do have a bit of a dark, sometimes uneven looking coloration and surface finish, and there can be a small amount of residue on the nozzles despite our final cleaning process. The coloration variance is normal and doesn’t affect function, any residue left on the nozzle will quickly be flushed in the first few millimeters of extrusion, especially if you flush it out with an abrasive filled material.